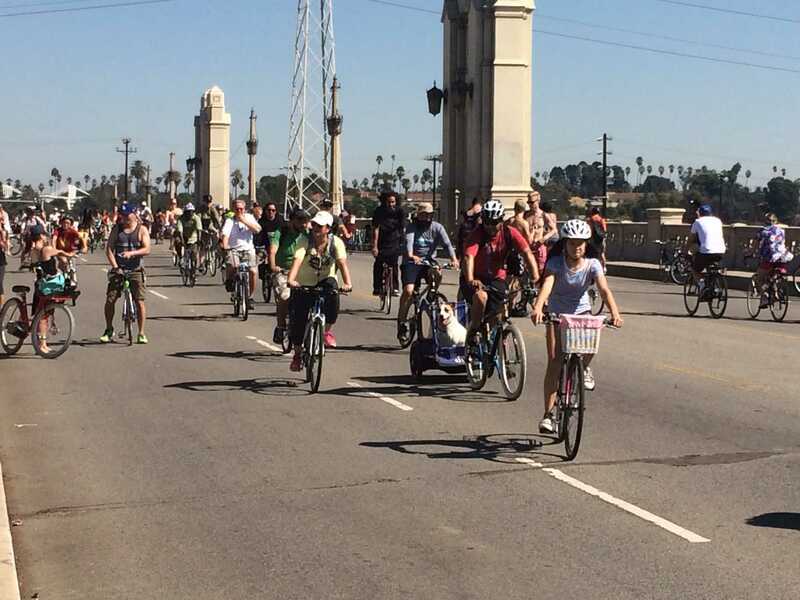 CicLAvia human and canine riders cross 4th Street bridge heading back into downtown L.A. Priscilla Ross/The Sundial. Thousands took to the streets of Los Angeles on Sunday for CicLAvia, a free event meant to encourage people to use non-motorized transport to get around the city. Participants using any non-motorized transport were allowed to start wherever they liked along the route from 9 a.m. to 4 p.m. The route had no official start or end point. Perez-Seda said this is the second event this year after April’s CicLAvia route down Wilshire Boulevard. She said the third event will be a new route through South Los Angeles on Dec. 7. Producing each event with LADOT [Los Angeles Department of Transportation], L.A. Metro and LAPD takes at least two months of planning, according to Perez-Seda, including the planning of new routes and the hubs along the way. CSUN freshman Katie Martirosyan volunteered her time for the event in order to take donations at one of the many tents set up at the Mariachi Plaza hub. Other volunteers were seen giving free bike repair, promoting green living, or simply adding music to the mix for passing cyclists. Many business owners along the route stayed open, either promoting their companies or selling water and snacks to the participants. Some residents hosed down passing participants with water in the 90-degree-plus heat. The temperatures, however, did not seem to affect attendance. Though there is no official number, some think it could be anywhere from 50,000 to hundreds of thousands. Perez-Seda said this would be the first event with tracking devices, counting the number of people passing by checkpoints each hour, so a more precise report of attendees will be available soon. The CSUN Bike Collective, which invites both students and community members to join, added a few participants of its own. Clarke Miranda, a representative and member of the Bike Collective, said that many of the club’s riders were preparing to meet at CSUN before the CicLAvia event and ride from Northridge to downtown. Miranda said that the CSUN club promotes many rides within the community and also provides bike repair on campus to help some students get mobile. Other bicycle co-ops have proven successful in California. City wide bike-sharing programs, such as Citi Bike in New York, have also shown great previous success, but have been slower to catch on in Los Angeles. However, many don’t realize that California actually holds the third place spot for the state with the most miles of bike lanes, currently at 463 miles. Though only one percent of Angelenos are said to be bike commuters, there are close to 3.9 million people in the city, which means a lot of people are paying attention to this green movement. Los Angeles Mayor Eric Garcetti recently launched the Great Streets Initiative, which aims to streamline the planning process on upgrading street infrastructure. “It’s just an amazing way of meeting neighbors, seeing communities, getting out there and falling in love with L.A.,” the mayor told the Sundial. Garcetti said he’s been attending the CicLAvia event since it began in Los Angeles in 2004.